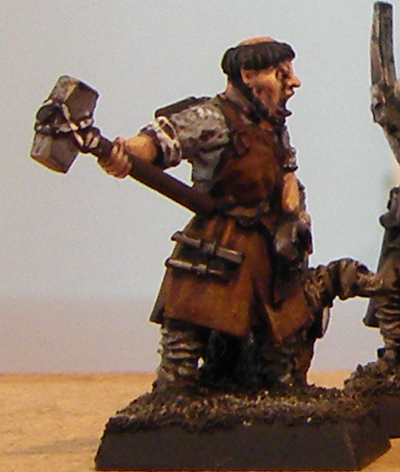 A hobby gone mad | Exactly how many miniatures does one man need? Exactly how many miniatures does one man need? 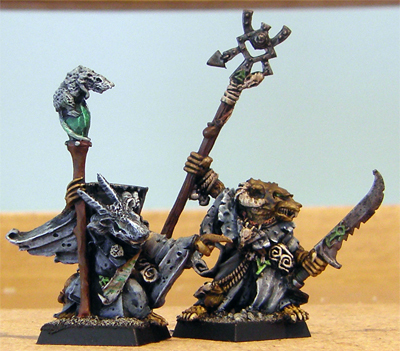 Now with the Skaven out of the way it’s time to publish one or two bits and pieces that I completed earlier in the year, but which I never got around to photographing. 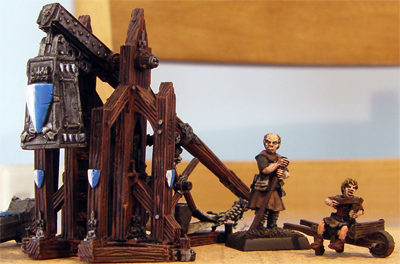 First up we have this Bretonnian Trebuchet. I recall having some problems assembling this one as a couple of the longer pieces had become bent. The metal was particularly soft, so I simply bent the pieces back in to shape. The machine itself is a bit ugly, but then I guess the real thing would have been too. The crew are also a pretty hideous bunch, but that’s a good thing. 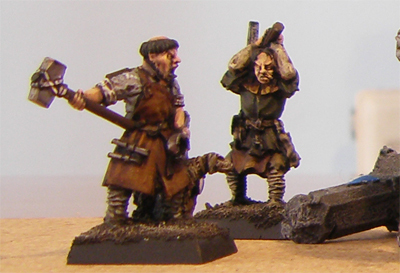 Peasants are supposed to be grimy looking and these certainly are. 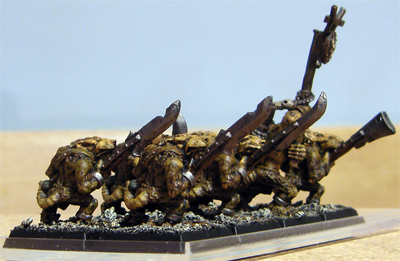 They are comfortably my favourite models in the Bretonnian range (I still consider the Green Knight a wood elf). 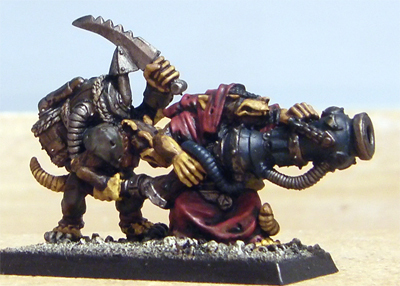 More Skaven. Last but not least. 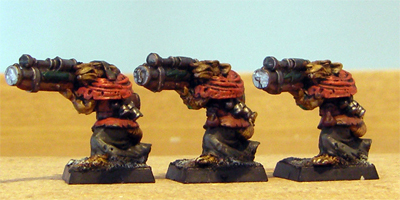 OK, these are the last of the Skaven for the time being, although I do have a sneaking suspicion that I’ve forgotten something. There are six of these two part Jezzail figures. Sadly, one of the holder figures (see below) went missing somewhere between the garden where he was being undercoated and my painting table. 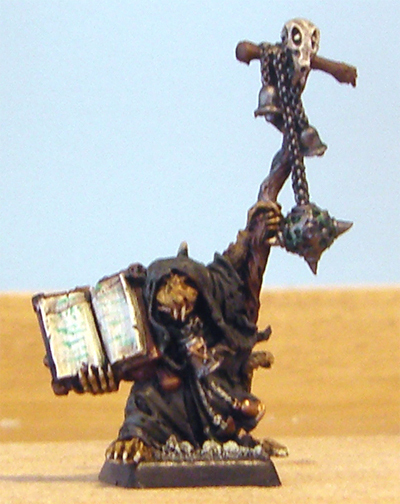 He has since turned up in amongst some black orcs, but he’s missed his appointment with my brush. 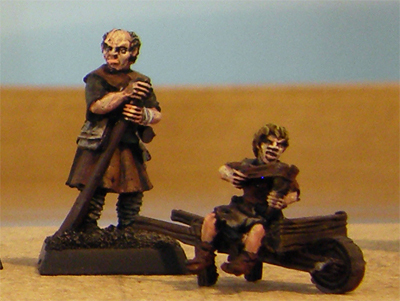 I think these are the original Jezzail team models. The certainly don’t match the other ones I already have, which are much smaller and come with a Pavaise. 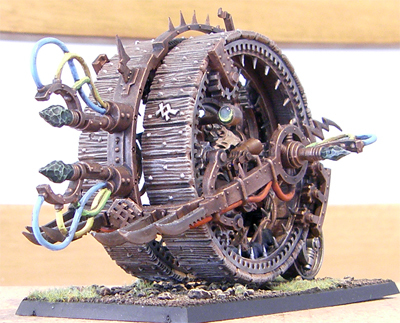 One of the most amusing items in the Clan Skyre arsenal is the Doomwheel. Some players swear by them, but I’m yet to be convinced. 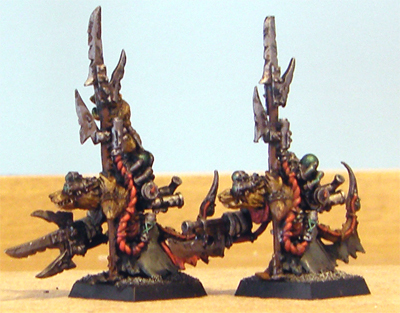 And that brings me to the last (and certainly the least) of this batch of Skaven: The Rat Swarms. 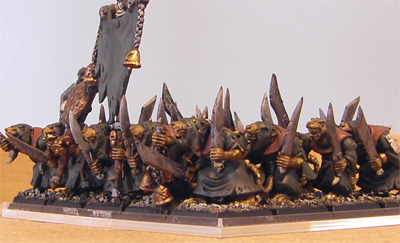 Swarms are pretty useless in Warhammer at the moment, and they have been for some time. It’s worth having some if you field an Abomination though, as it can turn in to swarms after it dies. 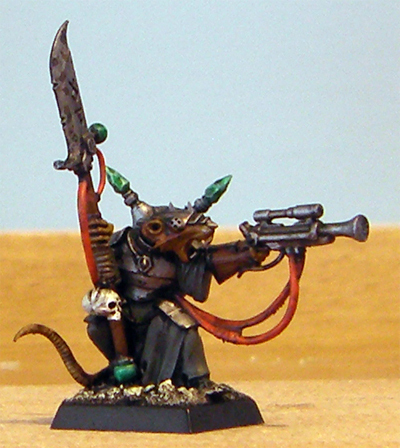 And that’s it for the Skaven for a little while. 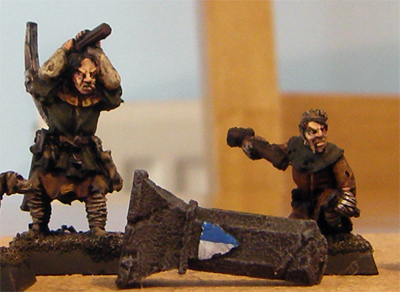 I do have a couple of named character models that I’m painting, but they aren’t going to be finished this year. Using my admittedly often bizarre counting system that’s another 30 towards my 2010 pledge. I’m still going to fail, but it’s looking closer than I thought it would back in October. 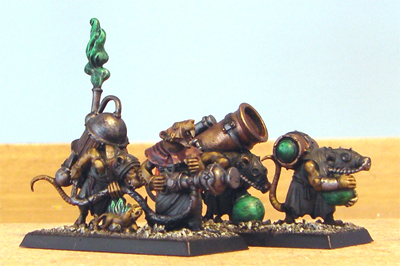 Yet more Skaven. Surely that’s them all now? 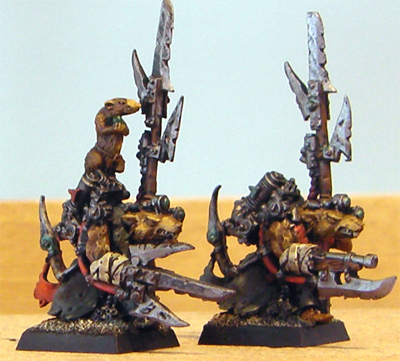 Keeping up with the recent batch of Skaven postings we have this batch of Skaven odds and ends. 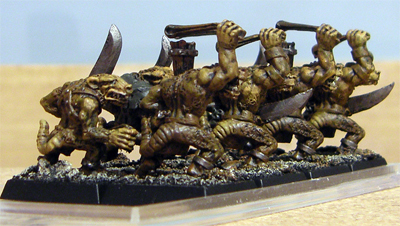 These were painted at the same time as my Island of Blood figures and are a random collection of older metal models that I had going spare. First off a couple of commanders. They could quite easily pass of Warlock Engineers. Note the scrolls and what could pass for Death Globes. Moving on, we have six musicians. 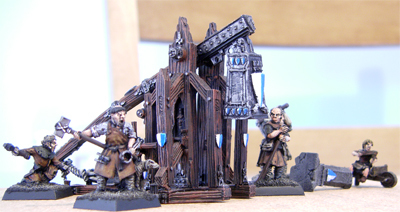 These will mostly be seeing duty as the solitary upgrade for my slave units. 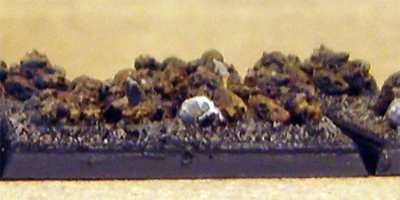 The two above are part plastic part metal models, whilst the two below are older metal models. 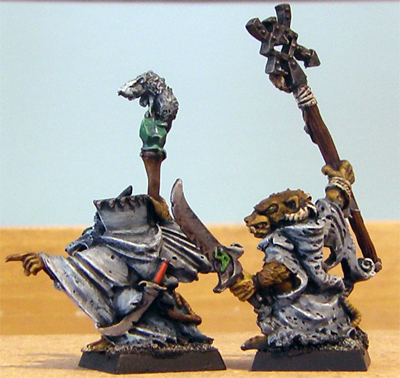 The one on the left is the slave musician, whilst the one on the right appears to be a Plague Monk. Here’s another shot of him. 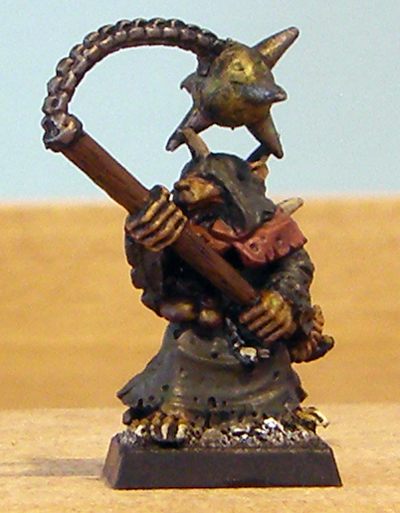 Finally, finishing up the musicians we have two Stormvermin musicians. These figures are giants when compared to the other ones. I suspect they’re going to look too out of place for me to use them amongst the slaves. 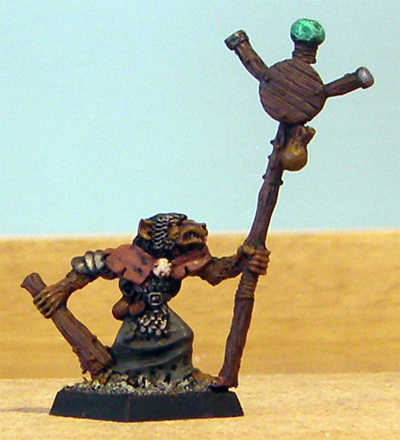 The next “odds and ends” I have is this standard bearer. 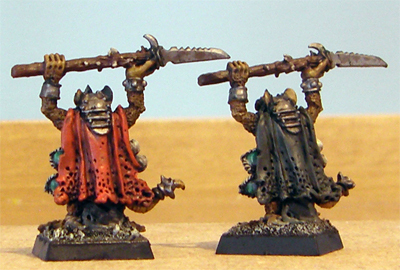 I’ve no idea where I’ll use the standard bearer, but I can see these two assassins appearing amongst my gutter runners. 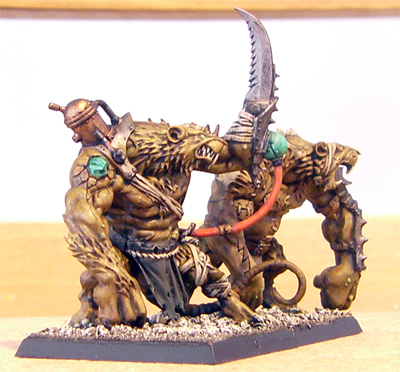 Next up we have two Grey Seers. I did warn you that these were a random collection of models. 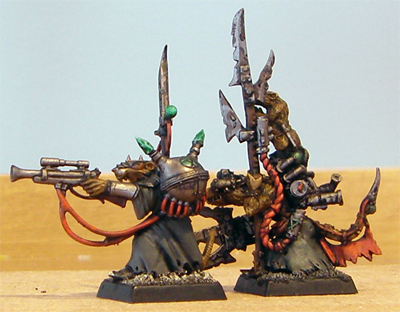 The one on the right is Thanquol. Sadly I don’t have the Boneripper model that should go with him. Finally, for today at least, we have two Poison Wind Globadiers. 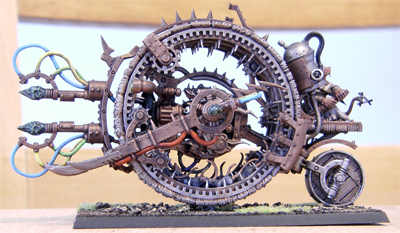 You got to love these insane models. 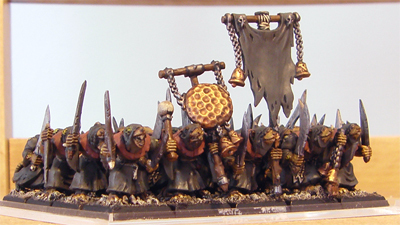 OK, so that’s another 15 miniatures to add to my 2010, but we’re now getting close to the end of the completed Skaven. 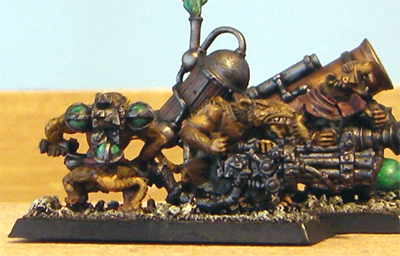 Even more Skaven. The blighters are everywhere! 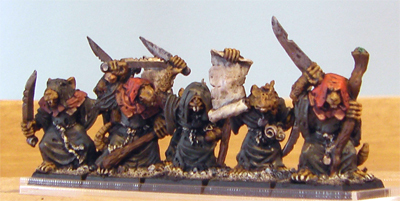 Here we have the next batch of my recently painted Skaven. 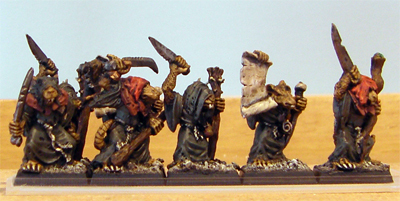 Today we have a unit of plastic Plague Monks plus one or two older metal plague monks. 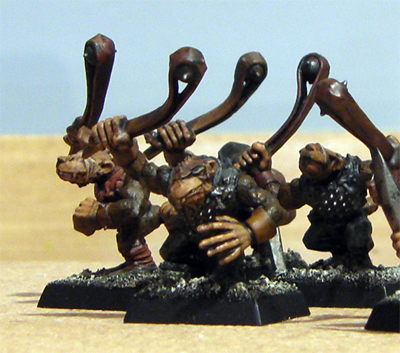 These were given one of my standard quick and dirty paint jobs, but as I hope this close-up shows, that’s more than enough for a good tabletop standard. I took a little bit longer on the metal figures, but not much longer. 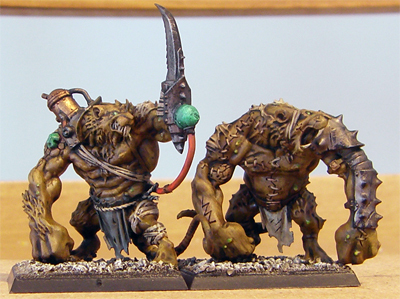 Also painted at the same time were these three Plague Censor Bearers. None of which are the current models. These ones are even nicer, although I’m likely to slip them in to my slave units rather than field them as censor bearers. 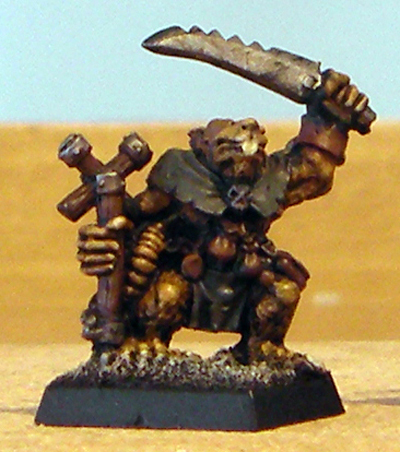 And to lead all these Clan Pestilens figures we have Lord Skrolk. 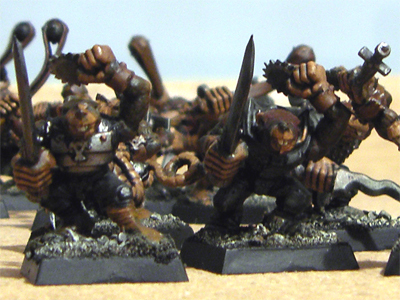 OK, so that’s another 33 miniatures to add to my 2010 output and there are still some more Skaven to come. 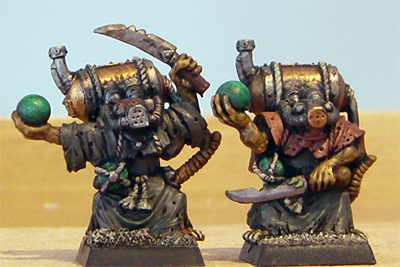 More Skaven. Is there no end to them? 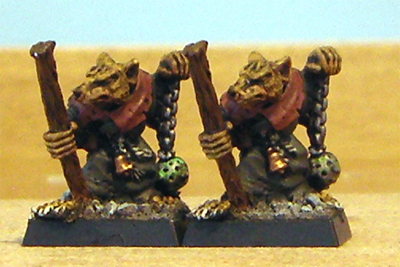 Along with the Island of Blood Skaven I’ve recently finished I painted a number of other Skaven that I’ve had laying around for some time. The figures are a mixture of plastics and some very old metals. Including 17 metal slaves. 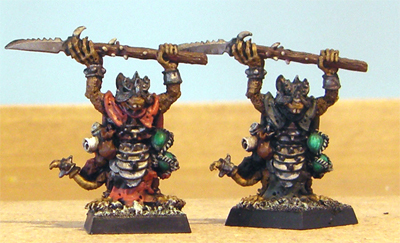 These are probably some of the best Skaven figures ever, lovely to paint and quick too. 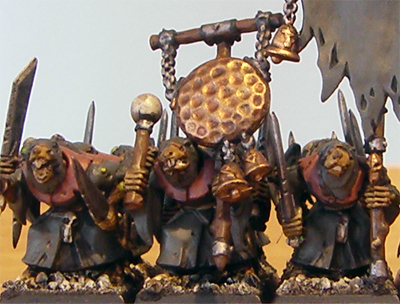 They are armed with an assortment of weapons, mostly hand weapons/halberds, but half of this batch have slings. Not that I’ve ever fielded them armed with slings. 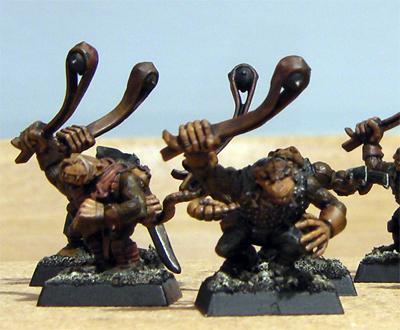 And here’s the ones with the hand weapons. 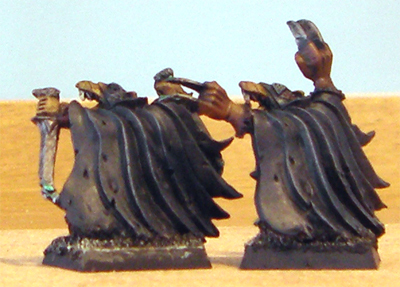 Now, compare and contrast the delightful metal slaves with these plastic night runners which I use as gutter runners. 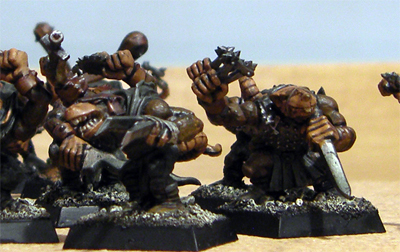 They matched the plastic clanrat models which were available at the time, but look very strange nowadays. 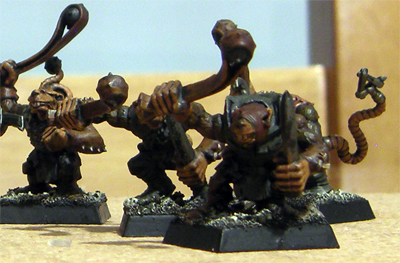 The old slave models fit in nicely with the current range, but I’m not so sure about these. I think it’s the overly large hands that are the problem. 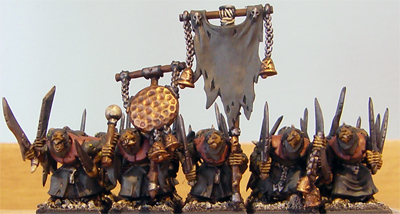 That’s 17 slaves and 16 night runners for my total and there’s still some more Skaven finished which I’ll post later.
. . . well, for the time being at least here are the last of my Island of Blood Skaven. 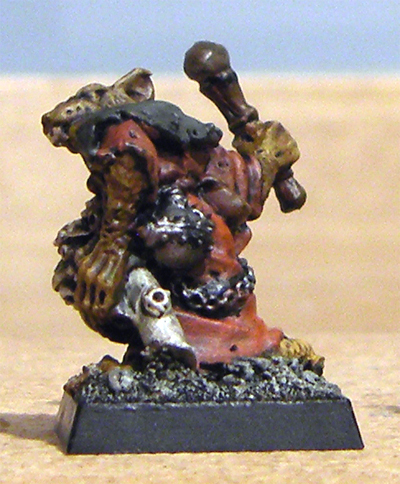 The Packmaster is up first . . .
. . . and his pet Rat Ogres . 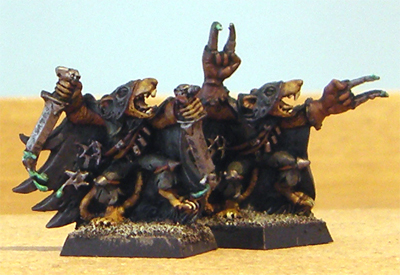 . .
That’s the Island of Blood Skaven finished, but there will be more Skaven to come over the next few days. 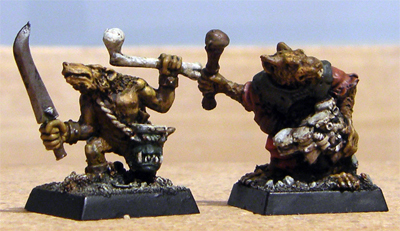 Unfortunately this update won’t have much of a positive impact on my 2010 Pledge update as I have just realised that I didn’t count the Rat Ogres as purchases. 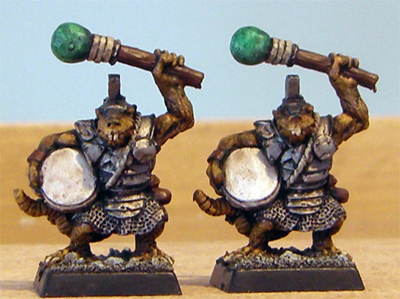 The rest of the Skaven in the Island of Blood set are almost complete. Only the Chieften / Warlord figure remains to be completed, so I’ll post some photographs of the others. First up we have the Engineer. A great figure, with lots of lovely equipment. 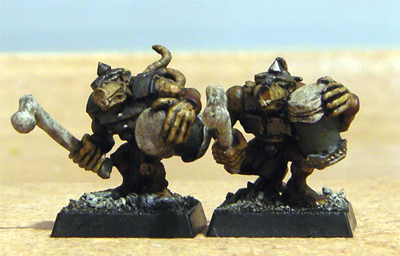 Sadly none of it is the sort of equipment players give their Skaven Engineers these days, but the same is true of the old metal engineers. 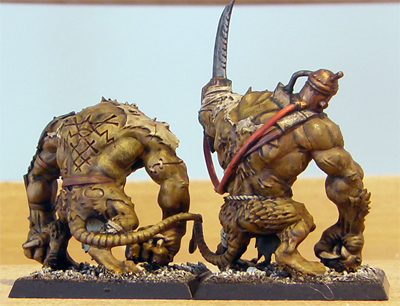 Here are a couple I painted at the same time to compare. And a side by side comparison . . . I just wish they did one with items that could pass for Doom Rockets and Brass Orbs. 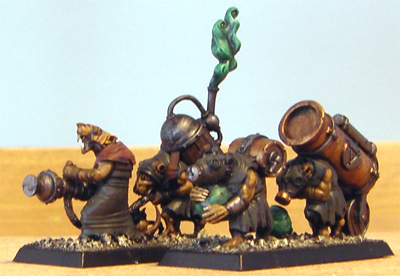 Also in the boxed set are two lovely weapon teams. 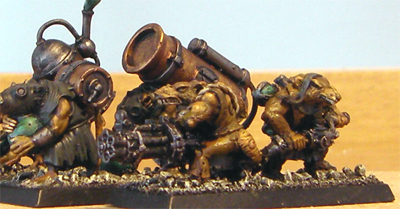 A Plague Wind Mortar and a Warpfire Thrower. 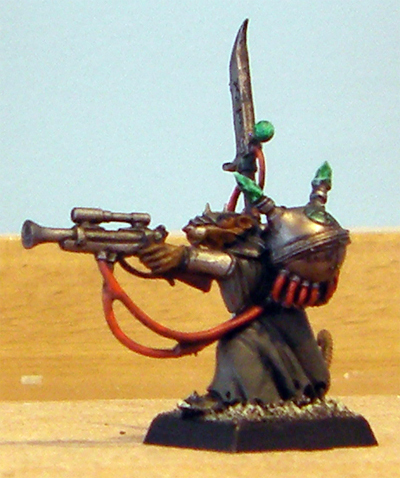 I also painted an old Warpfire Thrower for comparison. As you can see it’s not too bad a match, although it has a “chunkier” look and feel to it. 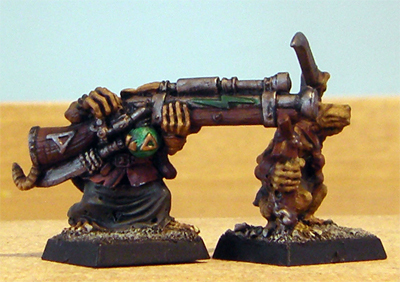 Also painted at the same time was a old metal Ratling Gun. Pictured here side by side with the Island of Blood teams. Again a pretty good match in both size and style. OK, I think this post is long enough as is. 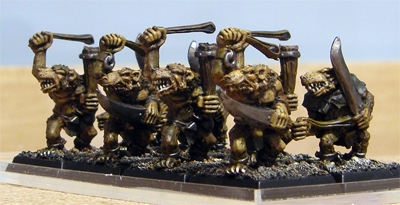 The Rat Ogres and Packmaster can wait for my next update.